Layer numbering is one of the cutting room processes which is taken place after cutting a marker. In this process, each garment component is marked with a serial number of the layer in the cut. Normally the numbering code contains garment size (e.g. Small, Medium, Large), Marker number and layer sequence. The worker can set the numbering format for each style and marker as desired. This process is also called as layer marking and ply numbering. 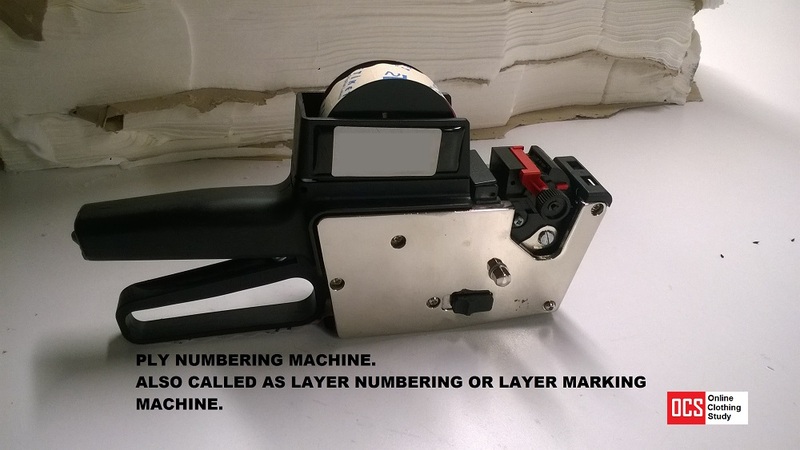 In the garment industry, a manual equipment is used for layer numbering. A typical equipment used for layer numbering is shown in the following image. I have taken two videos of ply number process from two different garment factories. Most of the mass garment manufacturers use this device in the cutting section. In this video, the layer numbering technique is shown. After practice and with the help of correct work aids worker can do this work very efficiently. To identify the right garment components of a garment (size, color, and shade) when operators stitch the garment. In case, sewing operator stitches a garment taking components from different layers, there might a chance of shade variation in the finished garment. This process helps factory to reduce quality issue related to shade variation. Most of the times, more than one sizes of the garment is loaded in the production line. When bundles are open and move on the machines, there might be a chance of taking garment parts from different bundles of garment sizes. This layer number helps an operator to identify correct size of the component. The layer number process can be automated but till date, there is no equipment or machine available. Some students had tried to develop a mechanical device to automate this process. Read this post to know little about that project. Layer marking process and equipment used for layer numbering process. See how fast an worker can do numbering of a cut components.